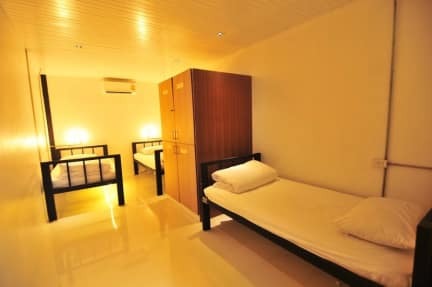 Freedom Hostels@Phi Phi is a distinct addition to Koh Phi Phi and a smart choice for travelers. The city center is merely away and the airport can be reached within minutes. With its convenient location, the hotel offers easy access to the city's must-see destinations. Freedom Hostels@Phi Phi also offers many facilities to enrich your stay in Koh Phi Phi. To name a few of the hotel's facilities, there are free Wi-Fi in all rooms, Wi-Fi in public areas, smoking area, lockers. All guest accommodations feature thoughtful amenities to ensure an unparalleled sense of comfort. The complete list of recreational facilities is available at the hotel, including garden. Superb facilities and an excellent location make the Freedom Hostels@Phi Phi the perfect base from which to enjoy your stay in Koh Phi Phi. 3. Payment: Cash or credit card (Visa, Master) is welcomed upon arrival. (1) Any cancellation received within 3 day/s prior to arrival will incur the first 1 night/s charge. (2) Failure to arrive at your hotel will be treated as a No-Show; the total amount will be charged and no refund will be given. 5. Age Restrction: The minimum age to stay in the hostel is 18 years old. Really quiet and relaxed ans it’s an easy walk to the party beach if you are looking for something to do in the evening. Really sweet people work there. Ich fand das Hostel sehr gut. Die Matratzen waren tatsächlich sehr hart aber wir könnten trotzdem gut schlafen. Die Badezimmer waren auch alle sauber. Das Hostel ist ein wenig abgeleben aber dadurch kann man sehr gut schlafen. Overall a nice hostel. Definitely not a party hostel, but we weren’t looking for that. That’s also the reason why it’s a little bit further away, about a 10 min walk from the Main Street. But very quiet because of that. Toilet and shower in one room, making it very wet but it was mostly clean. Big lockers that the backpacks fit in. Would recommend. Ein sehr ruhiges Hostel allerdings nicht gerade sauber... Allerdings erfüllt es seinen Zweck! Nicht zu vergessen Strom und Internet gibt es nur zwischen 17 Uhr abends über die nacht bis 9 Uhr morgens! Allerdings wohl doch eines der wenigen Ruhigen Hostels für den Preis! it was okay but not the best hostel. The way from the room to the bathrooms was to long. nicht länger als zwei Nächte, Matratze SEHR hart. Toiletten schmutzig. Zimmer sauber. Gute Lage. Hostel war ok. Leider waren die Matratzen extrem hart und es gab keinen Mülleimer im Zimmer. Lage ist in Ordnung, wenn einen der Hahn nicht stört... Man hört wirklich alles! Die Duschen/Toiletten waren sehr dreckig, da beides in einem Raum ist. Toilettenpapier musste man sich vorher mitnehmen... Insgesamt aber ganz ok. This hostel is missing some essentials, like a bin in the room, a place to dry the towels. Toilet and shower are in one room so the toilet is very wet all the time and it's dirty. And there is no place to put your stuff while showering, so you have to put it on the toilet and everything gets wet. I liked the area around because it was very quiet and close to the beach.